What is the difference between AI/ML/DL? 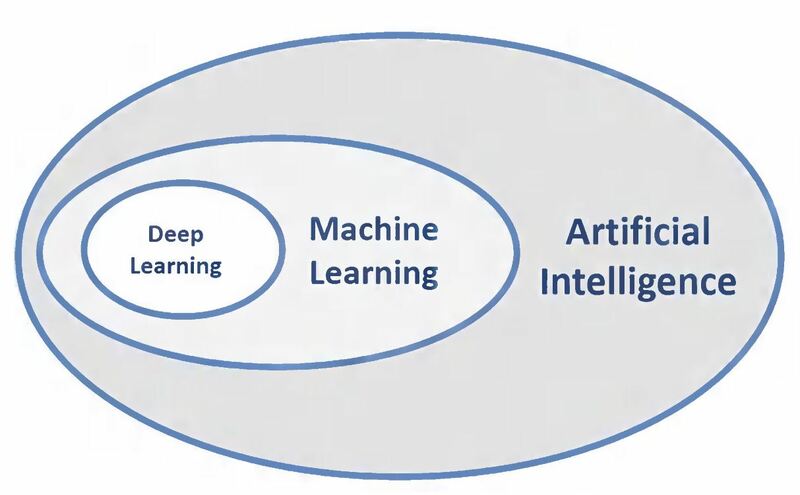 What is the difference between Artificial Intelligence (AI), Machine Learning (ML) and Deep Learning (DL)? I) Brief answer: It is the same and it is different. Deep Learning can also belong to both, and: both are necessary. This explains well why HCI-KDD is so enormously important: Human–Computer Interaction (HCI) deals mainly with aspects of human perception, human cognition, human intelligence, sense-making and the interaction between human and machine. Knowledge Discovery from Data (KDD), deals mainly with artificial intelligence, the computational intelligence and with the development of algorithms for automatic and interactive data mining . Figure 1 from: Andreas Holzinger, Peter Kieseberg, Edgar Weippl & A Min Tjoa 2018. Current Advances, Trends and Challenges of Machine Learning and Knowledge Extraction: From Machine Learning to Explainable AI. Springer Lecture Notes in Computer Science LNCS 11015. Cham: Springer, pp. 1-8, doi:10.1007/978-3-319-99740-7_1. I) The first wave was a kind of a programmed ability to process information, i.e. engineers handcrafted a set of rules to represent knowledge in (narrowly) well-defined domains. The structure of this knowledge is defined by human experts and specifics in the domain are explored by computers. Interestingly, these first approaches were explainable (see explainable AI). II) The second wave of AI is the success of statistical/probabilistic learning, i.e. engineers create statistical models for specific problem domains and train them, preferably on very big data sets. (BTW: John LAUNCHBURY emphasizes the importance of geometric models for machine learning, e.g. manifolds in topological data analysis – exactly what we foster, see CD-MAKE Topology) and this beautiful recent article by Massimo FERRI. Currently neural networks (deep learning) show tremendously interesting successes (see e.g. a recent work from our own group . III) The future third wave will have to focus on explainable ai, i.e. contextual adaptation (understanding the context – which to date needs a human-in-the-loop! ), and make models able to explain how an algorithms came to a decision (see my post on transparceny and trust in machine learning and our recent paper , and see our iML project page). In essence ALL three waves are necessary in the future and the combination of various methods promise success! Deep Learning (DL) is one methodological family of ML based on, e.g. artificial neural networks (ANN), deep belief networks, recurrent neural networks, or to give a precise example of a feed forward ANN: the multilayer perceptron (MLP), which is a very simple mathematical function mapping a set of input data to output data. The concept behind is representations learning by introducing other representations that are expressed in terms of simpler representations. Maybe, this is how our brain works , but we do not know yet. However, this immediately let us understand the huge shortcomings of these approaches: While these algorithms nicely recognize a cat, they cannot explain why it is a cat. The algorithm is unable to explain why it come to this conclusion. Consequently, the next level of machine learning and artificial intelligence is in explainable AI, see transparency. A final note to my students: computational intelligence (you may call it either Artificial Intelligence (AI) or Machine Learning (ML) may help to solve problems, particularly in areas where humans have limited capacities (e.g. in high dimensional spaces, large numbers, big data, etc. ); however, we must acknowledge that the problem-solving capacity of the human mind is still unbeaten in certain aspects (e.g. in the lower dimensions, little data, complex problems, etc.). A strategic aim to find solutions for data intensive problems is effectively the combination of our two areas: Human–Computer Interaction (HCI) and Knowledge Discovery (KDD). A proverb attributed perhaps incorrectly to Albert Einstein (many proverbs are attributed to famous persons to make them appealing) illustrates this perfectly: “Computers are incredibly fast, accurate, but stupid. Humans are incredibly slow, inaccurate, but brilliant. Together they may be powerful beyond imagination”. Consequently, the novel approach to combine HCI & KDD in order to enhance human intelligence by computational intelligence fits perfectly to AI and ML together . Holzinger, A. 2013. Human–Computer Interaction and Knowledge Discovery (HCI-KDD): What is the benefit of bringing those two fields to work together? In: Cuzzocrea, Alfredo, Kittl, Christian, Simos, Dimitris E., Weippl, Edgar & Xu, Lida (eds.) Multidisciplinary Research and Practice for Information Systems, Springer Lecture Notes in Computer Science LNCS 8127. Heidelberg, Berlin, New York: Springer, pp. 319-328, doi:10.1007/978-3-642-40511-2_22. Goodfellow, I., Bengio, Y. & Courville, A. 2016. Deep Learning, Cambridge (MA), MIT Press. Mcculloch, W. S. & Pitts, W. 1943. A logical calculus of the ideas immanent in nervous activity. Bulletin of Mathematical Biology, 5, (4), 115-133, doi:10.1007/BF02459570. Singh, D., Merdivan, E., Psychoula, I., Kropf, J., Hanke, S., Geist, M. & Holzinger, A. 2017. Human Activity Recognition Using Recurrent Neural Networks. In: Holzinger, Andreas, Kieseberg, Peter, Tjoa, A. Min & Weippl, Edgar (eds.) Machine Learning and Knowledge Extraction: Lecture Notes in Computer Science LNCS 10410. Cham: Springer International Publishing, pp. 267-274, doi:10.1007/978-3-319-66808-6_18. Holzinger, A. 2017. Introduction to Machine Learning and Knowledge Extraction (MAKE). Machine Learning and Knowledge Extraction, 1, (1), 1-20, doi:10.3390/make1010001. Hinton, G. E. & Shallice, T. 1991. Lesioning an attractor network: Investigations of acquired dyslexia. Psychological review, 98, (1), 74.